Harrogate Town boss Simon Weaver sent a wish upon his in-form stars as he urged his merry men to ride into the Skrill North play-offs by Christmas. Michael Woods’ dazzling hat-trick entertained a bumper 1,400-strong crowd at the CNG Stadium on Saturday as Town overwhelmed resurgent Gloucester City 4-2. Craig Nelthorpe also curled in direct from a corner as in-form Town marked a seventh league win in eight matches (report on page 85). 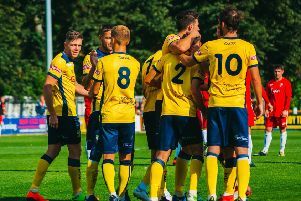 The victory hauled Town within touching distance of the Skrill North play-offs in sixth, two points behind the top five. Weaver pinpointed his sparkling goalscorers for praise following the destructive spell that saw off City. “For Woodsy to have scored five goals in two home games, that is a massive achievement,” he said. “He sees things so quickly, it’s as if he has eyes in the back of his head. “Craig’s composure on the ball makes him one of the form players in Skrill North, from left-back. Steve Mallory slotted into defence after Leigh Franks (ankle) pulled out injured minutes before the home clash. The Bradford Park Avenue recruit will start again alongside Shane Killock at Worcester City on Saturday, with Franks expected to be out for six weeks. Fellow defender Tom Allan has returned to parent club York City. Ashley Worsfold should be fit to make the trip south, but faces competition from his replacement Chris Hall for a starting jersey this week. And Weaver anticipates lowly Worcester, who Town beat 2-0 in November, to be “dangerous” on the counter. He added: “City have some good young lads that are fit and fast. “They felt unlucky not to get a point against us at our place. Town now sit only behind leaders Hednesford Town in the scoring charts, having netted 38 times. The also moved above Stalybridge Celtic to top the All Time Skrill North standings, having picked up 574 points in 393 matches at this level. “We have to keep the winning run going. While people are on form, we want to rack up as many points as possible,” said Weaver. “The goals have been shared around. Since we have had the pull out goals in training it seems to have helped. “The strikers are lashing ball in the back of the net in training sessions, perhaps confidence has gone up. “It’s certainly good to have them all in a rich vein of form.